Widget coordinates: Coordinates relative to the widget (usually `widget->window`). Several functions are available for converting between the different coordinate systems. The most common translations are between widget and bin window coordinates and between bin window and tree coordinates. For the former you can use convert_widget_to_bin_window_coords (and vice versa ), for the latter convert_bin_window_to_tree_coords ( and vice versa). with name treeview and style class .view. It has a subnode with name header, which is the parent for all the column header widgets' CSS nodes. For rubberband selection, a subnode with name rubberband is used. Setting the GtkTreeView::fixed-height-mode property to true speeds up TreeView by assuming that all rows have the same height. Enables or disables the hover expansion mode of tree_view. Enables or disables the hover selection mode of tree_view. Appends column to the list of columns. Recursively collapses all visible, expanded nodes in this. Resizes all columns to their optimal width. Converts bin_window coordinates (see get_bin_window) to widget relative coordinates. Converts widget coordinates to coordinates for the bin_window (see get_bin_window). Creates a XlibSurface representation of the row at path. Recursively expands all nodes in the this. Expands the row at path. Fills the bounding rectangle in bin_window coordinates for the cell at the row specified by path and the column specified by column. Returns the window that this renders to. Returns a List of all the TreeViewColumn s currently in this. Fills in path and focus_column with the current path and focus column. Determines the destination row for a given position. Returns whether or not tree lines are drawn in this. Returns the column that is the current expander column. Returns whether fixed height mode is turned on for this. Returns which grid lines are enabled in this . Returns true if the headers on the this are visible. Returns whether hover expansion mode is turned on for this. Returns whether hover selection mode is turned on for this. Returns the amount, in pixels, of extra indentation for child levels in this. Returns the model the TreeView is based on. Queries the number of columns in the given this . Finds the path at the point (x, y), relative to bin_window coordinates (please see get_bin_window). Retrieves whether the user can reorder the tree via drag-and-drop. Returns whether rubber banding is turned on for this. Gets the setting set by set_rules_hint. Returns the Entry which is currently in use as interactive search entry for this. Gets the TreeSelection associated with this. Returns whether or not expanders are drawn in this. This function is supposed to be used in a query_tooltip signal handler for TreeView. Fills visible_rect with the currently-visible region of the buffer, in tree coordinates. This inserts the column into the this at position. Creates a new TreeViewColumn and inserts it into the this at position. Convenience function that inserts a new column into the TreeView with the given cell renderer and a TreeCellDataFunc to set cell renderer attributes (normally using data from the model). Determine whether the point (x, y) in this is blank, that is no cell content nor an expander arrow is drawn at the location. Returns whether a rubber banding operation is currently being done in this. Moves column to be after to base_column. Moves the alignments of this to the position specified by column and path. Scrolls the tree view such that the top-left corner of the visible area is tree_x, tree_y, where tree_x and tree_y are specified in tree coordinates. Cause the row_activated signal to be emitted on a single click instead of a double click. Sets a user function for determining where a column may be dropped when dragged. This function should almost never be used. Sets the row that is highlighted for feedback. Sets whether to draw lines interconnecting the expanders in this. Sets the column to draw the expander arrow at. Enables or disables the fixed height mode of this . Sets which grid lines to draw in this. Enables or disables the hover expansion mode of this. Enables or disables the hover selection mode of this. Sets the amount of extra indentation for child levels to use in this in addition to the default indentation. Sets the model for a TreeView. Enables or disables rubber banding in this . Sets a hint for the theme to draw even/odd rows in the this with different colors, also known as "zebra striping". Sets the entry which the interactive search code will use for this this. Sets the compare function for the interactive search capabilities; note that somewhat like strcmp returning 0 for equality TreeViewSearchEqualFunc returns false on matches. Sets whether to draw and enable expanders and indent child rows in this. Sets the tip area of tooltip to the area path, column and cell have in common. 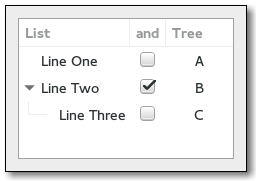 If you only plan to have simple (text-only) tooltips on full rows, you can use this function to have TreeView handle these automatically for you. Sets the tip area of tooltip to be the area covered by the row at path. The move_cursor signal is a [keybinding signal][ GtkBindingSignal] which gets emitted when the user presses one of the cursor keys. The "row-activated" signal is emitted when the method row_activated is called, when the user double clicks a treeview row with the "activate-on-single-click" property set to false, or when the user single clicks a row when the "activate-on-single-click" property set to true. The given row is about to be collapsed (hide its children nodes). The given row is about to be expanded (show its children nodes).